It's a bird, it's a plane, it's SUPERMAN!!!!! Is it a Bedskirt? No It's a Dress!!! Looking for a fast and satisfying project? Then this is for you. It takes about 10 minutes to make!!! I wanted to make Aiyanna another dress. One that she could wear year round. She had this shirt that had a stain on the bottom so it was perfect for this project from Ruffles and Stuff. 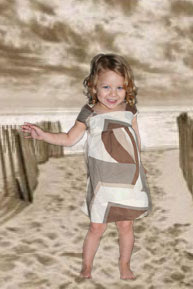 The only thing I did differently was I used one of my t-shirts for the bottom part of the dress. I cut it below the arms and then gathered and sewed it to the shirt. No hemming because my shirt was already hemmed!!!! Lookey what came in the mail the other day!!! I won this giveaway from Noodlehead. Thank you Anna! Dakota LOVES his new backpack!!! I was out shopping at a thrift stores one day and found this shirt. I loved the fabric , but it was about 2 sizes to small for me, but I bought it anyway because it was dirt cheap (25 cents!!!) and I knew I could make something from it. I was wanting to make Aiyanna a dress the other day so I pulled out this shirt and Tada!!! This is a super simple project that took about 30 minutes to do. Here is the shirt I started with. Cut the shoulder strap about 1.5 inches before the seam on the front of the shirt. Then I put the shirt on Aiyanna and pinned the sides to fit. I played with the straps until I liked how it looked. Using my pins as guides I cut the sides of the shirt. I french seamed the sides and finished the arm holes. Then I sewed the straps to the front and hemmed the bottom to shorten it some. I left the original hem so I can let it out as she gets taller. I always like to try to give something handmade as gifts to family. I have made my hubby button down shirts in the past, but I wanted to do something different this year. Also it need to be something that didn't cost a lot in supplies. We were walking around the mall and went into Buckle. I had never been in there before, WOW!!! I love how they embelish some of the clothing. I don't love the prices though. They had some jeans that Scott loved but the price tag was $175, UGH!!!! Here they are. Aren't they awesome! I thought about these pants for a few days and then one day we were at Michaels and the light bulb went off. I knew I could recreate them for cheap. I bought a bag of their scrap leather for $9.99 went home and got busy. I took the pocket off a pair of jeans he had. Then I did a reverse applique of a leather cross. Scott told me he wanted them to have ragged edges. So that's what he got. 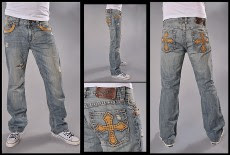 I didn't stop there.....I had googled images of jeans with crosses and found a pretty cool one that had leather crosses on the front pant leg. Of course I had to do it. I love how it turned out. 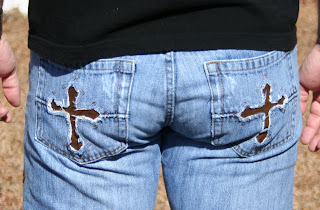 I just cut the leather in cross shapes and taped them down to the jeans. I used tape instead of pins because I didn't want to put little holes in the leather. I wanted to make Aiyanna a cupcake shirt similar to the heart shirt I made a few weeks ago. I didn't want to try to hunt down the trim because I have no idea where I got it. I had some pink jersey fabric I thought would work great. So here is what I came up with. 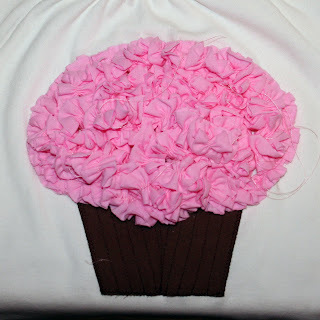 I cut a piece of brown fabric to look like a cupcake liner. I applied WonderUnder to the fabric and then ironed it to the shirt. Next I sewed vertical lines to make it look like the creases in the cupcake liner. Use a watersoluable pen to draw the top of the cupcake. Cut 3 stirps of jersey 60" long and 1 1/2" wide. Set your sewing machine tension to +3. This will automatically ruffle your fabric for you. Sew down the center of your fabric. Look at all the ruffles! Starting on the outside sew your ruffles onto the shirt and work your way to the middle Sew down the center of the ruffle. When you get to the end of one ruffle piece just overlap the next one a little bit and keep on sewing. Here is how it will look when you fill it all in. I was putting these tights on Aiyanna the other day and somehow they got a BIG hole right on the top of her foot. I didn't want to thro them away. Other than the hole they are perfect. She has a pink pair of footless tights that she wears a lot. 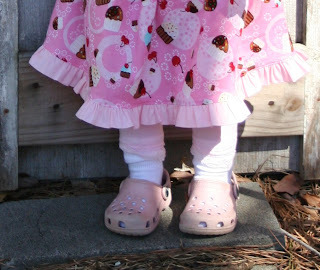 we have wood floors and in thights she falls So I put footless tights and no skid socks on her when she wears a dress that way she can stay warm and safe. So I just turned these into footless tights. It's so simple. 3 steps is all it takes. Cut the feet off the tights. Sew a piece of strestchy lace together. I made mine 6" long for each leg. Sew lace to bottom of tights. If you don't have lace you can just sew the edges using a zigzag stitch. Make sure you stretch it as you go so you get a pretty lettuce edge. If you were to visit my Mother-in-Law in the spring or summer you would sit on a swing on her back porch drinking "a spot of tea" and snacking on a scone fresh out of the oven. You would enjoy the view and smell of her gorgeous rose garden. She loves roses! I love roses too and could spend all day just looking at them.. She has her rose garden in the back, rose bushes, more like shrubs, in the front and roses on all sides of the house. Did I mention she loves roses? See how beautiful!!!! Where are you spring??? I am ready to sit on the porch and enjoy the roses again.